Aspiring engineering kids can now take a few lessons at home soon. My Baby Excels has entered into an agreement with Nut and Bolts to sell its iconic brand Meccano in India. Meccano, established in 1901 by Frank Hornby, is a model construction system comprising re-usable metal strips, plates, angle girders, wheels, axles and gears, with nuts and bolts to connect the pieces which enable the building of working models and mechanical devices. My Baby Excels is a premium toy label, representing international bestsellers like Leap Frog, Disney Plush and WowWee in India. Meccano will also launch its extensive product line including the construction range, tuning range and multi-model range, among others. "We are pleased to partner with Meccano and forward their cause in India. India is a hotbed of engineering talent and we look forward to leverage the demand here. Moreover, the brand enjoys a cult status among enthusiasts in India. We will be focusing on widening the reach and base of the product line,” said MN Kapasi, managing director, My Baby Excels, in a release. Excel Productions Audio Visuals owns Excel Interactive (a leading gaming company and India licensee for Electronic Arts and Disney Interactive Studios). 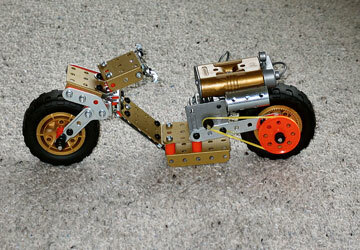 The toy, earlier known as "Mechanics Made Easy" is based on the principles of mechanical engineering. The construction kits gained immense popularity, which later became known as Meccano. In September 1907, Mr Hornby registered the Meccano trade mark, and in May 1908, he formed Meccano Ltd.
Meccano caters to children above 5 years and young adults. The products are priced from Rs599 onwards and will be available at all leading stores across the country.